The first remote ink control system with a truly segmented blade was invented by Frank Perretta in the late 1970s. It was designed to be retrofitted on existing press lines. In 1981, Perretta Graphics was then formed to market this new invention to the printing industry. Segmented ink keys have now become the standard in the modern pressroom. However, no other company has been able to equal the performance and reliability of the Perretta ink control system. When Perretta Graphics was first started in the 1980s, we quickly became a global solutions provider for remote ink control on both new and existing presses. We also began to manufacture our own plate scanners to preset the Perretta ink control system. 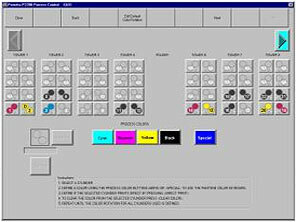 Then, in the 1990s, we continued to expand our product offerings with the first custom digital interface from a customer's prepress to an ink control system in the printing industry - before the CIP3 or CIP4 standards were introduced. We also developed our first closed loop color system. Today, Perretta Graphics has a full range of new Windows based designs in our new 2500 model suite of products: P 2500 Remote Ink Control, DPC 2500 Digital Preset, CLC 2500 Closed Loop Color, and CLR 2500 Closed Loop Register Control. All of our products are now available on new presses or can be retrofitted to an existing press line. At Perretta Graphics, we are committed to designing and developing the most technologically advanced, cost effective process control equipment available for the graphic arts industry. As process control specialists, our products offer you the tools you need to experience quicker, more efficient make ready and to maintain the highest quality standards possible throughout a press run. With sound engineering and stringent quality standards during all phases of manufacturing, Perretta offers its customers the most reliable, high performance products available. By applying state of the art technology, we ensure that the competitive edge we give you today extends far into the future.